For other uses, see Bock (disambiguation). Bock is a strong lager of German origin. Several substyles exist, including maibock (helles bock, heller bock), a paler, more hopped version generally made for consumption at spring festivals; doppelbock (double bock), a stronger and maltier version; and eisbock, a much stronger version made by partially freezing the beer and removing the ice that forms. Originally a dark beer, a modern bock can range from light copper to brown in colour. The style is very popular, with many examples brewed internationally. The style known now as bock was a dark, malty, lightly hopped ale first brewed in the 14th century by German brewers in the Hanseatic town of Einbeck. The style from Einbeck was later adopted by Munich brewers in the 17th century and adapted to the new lager style of brewing. Due to their Bavarian accent, citizens of Munich pronounced "Einbeck" as "ein Bock" ("a billy goat"), and thus the beer became known as "bock". To this day, as a visual pun, a goat often appears on bock labels. Bockfest, in Cincinnati, Ohio, is the longest running and largest bock beer festival in the world. The festival celebrates bock beer, the Cincinnati neighborhood of Over-the-Rhine, the city's German heritage, and the coming of spring. Traditional bock is a sweet, relatively strong (6.3%–7.2% by volume), lightly hopped (20-27 IBUs) lager. The beer should be clear, and colour can range from light copper to brown, with a bountiful and persistent off-white head. The aroma should be malty and toasty, possibly with hints of alcohol, but no detectable hops or fruitiness. The mouthfeel is smooth, with low to moderate carbonation and no astringency. The taste is rich and toasty, sometimes with a bit of caramel. Again, hop presence is low to undetectable, providing just enough bitterness so that the sweetness is not cloying and the aftertaste is muted. The following commercial products are indicative of the style: Einbecker Ur-Bock Dunkel, Pennsylvania Brewing St. Nick Bock, Aass Bock, Great Lakes Rockefeller Bock, Stegmaier Brewhouse Bock. The maibock style, also known as helles bock or heller bock, is a helles lager brewed to bock strength; therefore, still as strong as traditional bock, but lighter in colour and with more hop presence. It is a fairly recent development compared to other styles of bock beers, frequently associated with springtime and the month of May. Colour can range from deep gold to light amber with a large, creamy, persistent white head, and moderate to moderately high carbonation, while alcohol content ranges from 6.3% to 7.4% by volume. The flavour is typically less malty than a traditional bock, and may be drier, hoppier, and more bitter, but still with a relatively low hop flavour, with a mild spicy or peppery quality from the hops, increased carbonation and alcohol content. The following commercial products are indicative of the style: Ayinger Maibock, Mahr’s Bock, Hacker-Pschorr Hubertus Bock, Capital Maibock, Einbecker Mai-Urbock, Hofbräu Maibock, Victory St. Boisterous, Gordon Biersch Blonde Bock, Smuttynose Maibock, Old Dominion Brewing Company Big Thaw Bock, [Brewery 85's Quittin' Time], Rogue Dead Guy Ale, Franconia Brewing Company Maibock Ale, Church Street maibock, and Tröegs Cultivator. Doppelbock or double bock is a stronger version of traditional bock that was first brewed in Munich by the Paulaner Friars, a Franciscan order founded by St. Francis of Paula. Historically, doppelbock was high in alcohol and sweet, thus serving as "liquid bread" for the Friars during times of fasting, when solid food was not permitted. Today, doppelbock is still strong—ranging from 7%–12% or more by volume. It is clear, with colour ranging from dark gold, for the paler version, to dark brown with ruby highlights for darker version. It has a large, creamy, persistent head (although head retention may be impaired by alcohol in the stronger versions). The aroma is intensely malty, with some toasty notes, and possibly some alcohol presence as well; darker versions may have a chocolate-like or fruity aroma. The flavour is very rich and malty, with toasty notes and noticeable alcoholic strength, and little or no detectable hops (16–26 IBUs). Paler versions may have a drier finish. The monks who originally brewed doppelbock named their beer "Salvator" ("Savior"), which today is trademarked by Paulaner. Brewers of modern doppelbocks often add "-ator" to their beer's name as a signpost of the style; there are 200 "-ator" doppelbock names registered with the German patent office. The following are representative examples of the style: Predator, Paulaner Salvator, Ayinger Celebrator, Weihenstephaner Korbinian, Andechser Doppelbock Dunkel, Spaten Optimator, Augustiner Maximator, Tucher Bajuvator, Weltenburger Kloster Asam-Bock, Capital Autumnal Fire, EKU 28, Eggenberg Urbock 23º, Bell's Consecrator, Moretti La Rossa, Samuel Adams Double Bock, Tröegs Tröegenator Double Bock, Wasatch Brewery Devastator, Great Lakes Doppelrock, Abita Andygator, and Wolverine State Brewing Company Predator. 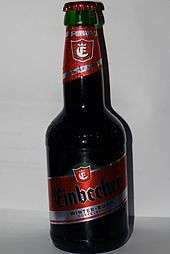 Eisbock beer, made by removing ice from partially frozen barrels of beer, resulting in higher alcohol content. Eisbock is a traditional specialty beer of the Kulmbach district of Germany that is made by partially freezing a doppelbock and removing the water ice to concentrate the flavour and alcohol content, which ranges from 9% to 13% by volume. It is clear, with a colour ranging from deep copper to dark brown in colour, often with ruby highlights. Although it can pour with a thin off-white head, head retention is frequently impaired by the higher alcohol content. The aroma is intense, with no hop presence, but frequently can contain fruity notes, especially of prunes, raisins, and plums. Mouthfeel is full and smooth, with significant alcohol, although this should not be hot or sharp. The flavour is rich and sweet, often with toasty notes, and sometimes hints of chocolate, always balanced by a significant alcohol presence. The following are representative examples of the style: Kulmbacher Reichelbräu Eisbock, Eggenberg, Schneider Aventinus Eisbock, Urbock Dunkel Eisbock, Franconia Brewing Company Ice Bock 17%. The strongest ice-beer is being produced by a Franconian company as well - it is called Schorschbräu and is 57% (current world record). Ayinger Celebrator Doppelbock. The goats on the label are a visual pun: ein bock means a billy goat. Weizenbock is a style of bock brewed using wheat instead of barley. 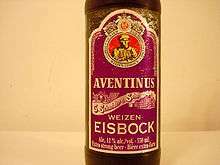 It was first produced in Bavaria in 1907 by G. Schneider & Sohn and was named Aventinus after a Bavarian historian. The style combines darker Munich malts and top-fermenting wheat beer yeast, brewed at the strength of a doppelbock. In Austria, bockbier is traditionally brewed only around Christmas and Easter, when nearly every brewery brews its own bock. A number of bock beers are produced, including Brasserie d'Achouffe Bok and "Leute Bok" from the Van Steenberge brewer, brewed since 1927. Belgium-based InBev produces Artois Bock, which is exported internationally and can be found in areas where bock is not traditionally available. Zagorka Brewery produces Stolichno Bock Beer, a 6.5% abv beer. From Bryghuset Svaneke, Bornholm, DK. "Stærke Preben", a bock brewed with Münchner and Caramel malt. First generation yeast only. Alc. 6.9% vol. Named after a local brewer. Bock is an unusual style in the UK, but a few examples exist. The Robert Cains brewery in Liverpool brews Cains Double Bock beer at 8% abv, and the Dark Star Brewery, West Sussex, produce a 5.6% abv Maibock. Dreher Brewery sells a rather strong (7.3% ABV) bock beer. It is called Bak, the name for billy goat in Hungarian. A variation of bock called 'bokbier' is also brewed extensively in the Netherlands and occasionally in Belgium. Most larger Dutch breweries, such as Heineken International, Grolsch, Amstel, Alfa Brouwerij, Brand and Dommelsch, market at least one variety. Most bokbiers tend to be seasonal beers (traditionally autumn, although there are currently also spring, summer and winter boks). Microbreweries may prefer to seasonally brew a bokbier, such as the eco-beer biobok, made in autumn by Brouwerij 't IJ in Amsterdam. The consumers' organization PINT holds a bok festival every autumn at the Beurs van Berlage in Amsterdam. Bocks are also brewed in Norway, where they are known as "bokkøl" (bockbeers) and available during the whole year. Notable examples of bock brands are Aass, Borg, Frydenlund and Mack. Bocks are also brewed in Poland, where they are known as "Koźlak" and available during the whole year. Notable examples of bock brands are Koźlak Amber, Miłosław Koźlak, Cornelius Kożlak, Perła Kożlak. One of the main beer brands in Portugal is Super Bock. The countries biggest brewer, Laško Brewery, made double bock named Striptis. It is the part of the Special line, which is a response to the rising interest of craft beers. Only one Bock beer is brewed in Sweden; Mariestad's Old Ox, with an alcoholic percentage of 6,9%. There are several beers brewed in Argentina which are termed bock, including Araucana Negra Bock, Quilmes Bock, and Blest Bock. In Bolivia, the Cerveceria Boliviana Nacional brews a beer called simply "Cerveza Bock," advertised primarily for its 7% alcohol by volume strength. In Brazil, Kaiser is one of the breweries that sells bock beer, called Kaiser Bock. This beer is available only in the months of fall and winter (April to September). Usually Brazilian bocks are produced by local breweries or craft breweries, especially in the cities of German settlement in Paraná/Santa Catarina States and also in Petrópolis, state of Rio de Janeiro. Kaiser Bock is made in Ponta Grossa, 100 kilometres (62 mi) from Curitiba, capital of Paraná. Inducerv S.A.S. brews a Bock (6.0% vol) under their Apóstol brand with German ingredients. The brewery is located in the city of Sabaneta, near Medellín. Microbrasserie de Bellechasse (Pub de la Contrée), Buckland, Quebec: "St-Nazaire"
Les Trois Mousquetaires, Brossard, Quebec: "GC Doppelbock"
Les Trois Mousquetaires, Brossard, Quebec: "SS Maibock"
Bushwakkers Brewpub, Regina, Saskatchewan: "Harbinger Maibock" and "Procrastinator Stopelbock"
Barley Days Brewery, Picton, Ontario: "May Bock"
Great Basin Brewing Company (Sparks, Nevada) occasionally produces Rock Mai Bock. Devils Backbone Brewing Company (Lexington, Virginia) produces TURBO Cougar Blond Bock Lager. Sly Fox Brewery (Phoenixville, Pennsylvania) hosts an annual goat race to commemorate its bock fest. Ziegenbock (owned by Anheuser-Busch), is brewed in Houston, Texas. Bowser Brewing Company (Great Falls, Montana) brews an occasional bock. Boulevard Brewing Company, of Kansas City, Missouri produces Boss Tom's Golden Bock, named for Thomas Pendergast who was a prohibition era "boss" of Kansas City's political machine. Anheuser Bush brews Amber Bock. Bock beer is produced and distributed under the Urbock label by Namibian Breweries. Like other Namibian Breweries beers, it is available in some of the neighbouring countries in Southern Africa, especially South Africa. The brewery also produces a maibock sporadically. "Forefathers Willie Simpson Doppelbock Lager" by Stone & Wood Brewing Co.
1 2 Bockbier - starker Genuss mit langer Tradition. Deutscher Brauer-Bund. 2011. 1 2 "Michael Jackson's Beer Hunter - Original Bock: the beer the doctor ordered". www.beerhunter.com. Retrieved 2010-10-07. 1 2 3 4 "Doppelbock". German Beer Institute. 2006. Retrieved 2010-10-07. ↑ Klemp, K. Florian (2014-03-01). "Understanding the Weizenbock Style". All About Beer. Retrieved 2016-10-11. ↑ "Artois Bock". RealBeer.com. 2005-05-31. Retrieved 2014-01-21. ↑ "Stolichno Temno (Bock)". ratebeer.com. Retrieved 2010-10-07. ↑ "Øl-sortiment" (in Danish). bryghuset-svaneke.dk. Archived from the original on 2005-12-20. Retrieved 2014-01-21. ↑ "Hvid Bock". Fuglsang.dk. 2010-09-27. Retrieved 2014-01-21. ↑ "Dreher Zrt". Dreherrt.hu. Retrieved 2014-01-21. ↑ "Araucana Negra Bock". www.ratebeer.com. Retrieved 2010-10-07. ↑ "Quilmes Bock". www.ratebeer.com. Retrieved 2010-10-07. ↑ "Blest Bock". www.ratebeer.com. Retrieved 2010-10-07. ↑ "Nuestra Marca | Bock". CBN. Retrieved 2013-02-19. ↑ http://www.apostol.com.co/Cervezas/Bock/tabid/128/Default.aspx Archived 2 April 2012 at the Wayback Machine. ↑ "Big Rock Brewery ® - Our Craft Beer". Big Rock Brewery ®. Retrieved 12 April 2015. ↑ "A Guide To Texas Beer". Drinking Made Easy. Inzane Entertainment. Retrieved 11 January 2015. ↑ "bockfest.com". bockfest.com. Retrieved 2010-10-07. ↑ "Brewery Scene Hopping In Reno-Tahoe". Reno Tahoe USA. Retrieved 11 April 2013. ↑ "Devil's Backbone Brewing Company". Retrieved 2 August 2014. ↑ "Narragansett Beer: Bock". Retrieved 27 September 2010. ↑ "Bowser Brewing Co". Bowserbrew.com. 2011-12-23. Retrieved 2014-01-21. ↑ "Boulevard Brewing Company". Boulevard.com. Retrieved 2014-01-21. ↑ Belgium, New. "Summer Helles". www.newbelgium.com. ↑ "Michelob.com". Michelob.com. Retrieved 2015-10-05. Wikimedia Commons has media related to Bock. Wikisource has the text of the 1920 Encyclopedia Americana article Bock Beer.